Interested in buying wholesale? Want to explore joint business opportunities? Get in touch to do business with us. With the pharmacig™ brand, both you and your customers benefit from a very profitable partnership. We manufacture the full range of vaping necessities - electronic cigarettes, e-liquids, coils and more. 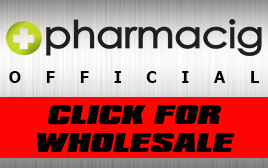 As pharmacig™ we offer quick turnaround products that sell very fast in the continually growing international vaping market. Aside from wholesale buying, we also offer lucrative customized possibilities such as exclusive country distributorships. Get in touch to do business with us. Please fill the form with as much detail as possible.